To Cite: Pazouki A, Omrani Z, Cheraghali R, Musavi S H. Strangulated Small Bowel in Traumatic Abdominal Wall Hernia: A Case Report and Literature Review, J Minim Invasive Surg Sci. 2014 ; 3(4):e12723. Introduction: Acute abdominal wall rupture with visceral herniation due to blunt traumas and bowel incarceration or perforation are generally rare phenomena. Such hernias tend to occur at anatomically weak spots in the lateral and lower abdominal wall. Case Presentation: A 24-year-old man with event of falling down from third floor was brought to Emergency Department of Hazrat Rasul Akram hospital. On Focused Assesment with sonography in trauma FAST examination there was fluid in the hepato-renal space and abdominal wall hematoma, as it seemed in the physical examination. The patient underwent midline laparotomy and 100cm of his small bowel was nonviable. Conclusions: Traumatic Abdominal Wall Hernia TAWH, although uncommon, is associated with significant rate of morbidity and mortality in cases of delayed diagnosis and intervention. Early intervention leads to a significantly better outcome. Acute abdominal wall rupture with visceral herniation due to blunt trauma is a rare entity (1-3). The shear forces generated by blunt trauma cause injury to intra-abdominal organs or bone structures more frequently than the abdominal wall itself; probably because of the elastic nature of the abdominal wall. In the rare event that abdominal wall herniation occurs, immediate intervention is needed following the traumatic event. Such hernias tend to occur at anatomically weak spots in the lateral and lower abdominal wall. Although bowel loops are the most common herniating viscera, bowel incarceration or perforation is rare (4-6). In this article we report an irreversible strangulated abdominal viscera herniation after blunt abdominal trauma. A 24-year-old man with event of falling down from third floor was brought to emergency department of Hazrat Rasul Akram hospital. He was conscious and his vital signs were stable. 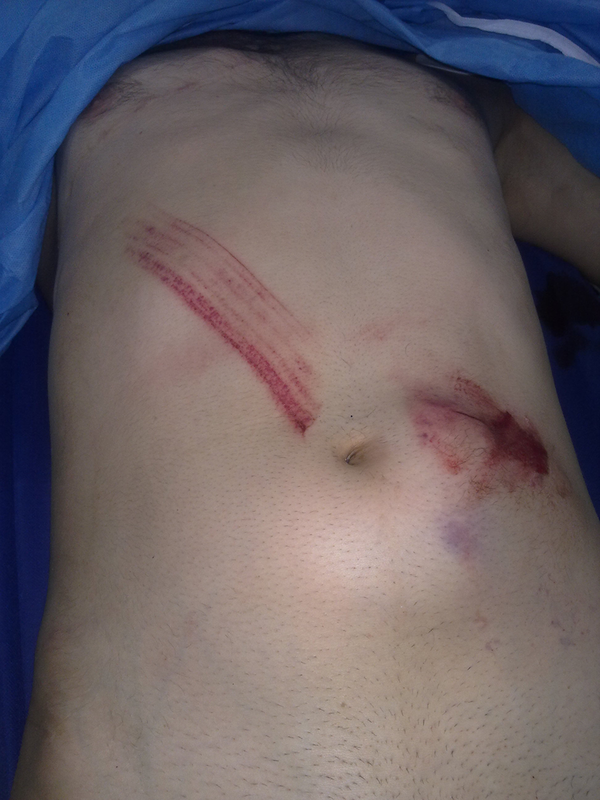 There were multiple abrasions on right upper quadrant of the abdomen, peri umbilical area and left abdomen (Figure 1). He had history of left postero-lateral thoracotomy because of previous stab wound on left thoracic wall and massive hemothorax, but had no history of any abdominal surgery. On physical examination he had generalized tenderness, which seemed to be from abdominal wall hematoma, especially in the peri umbilical and hypo gastric region. Abdominal examination revealed a tender reducible mass of 8×10 cm2 in left side of the umbilicus. Pelvis was stable. On fast examination there was fluid in the hepato-renal space and abdominal wall hematoma. Routine serum tests were within normal limits. 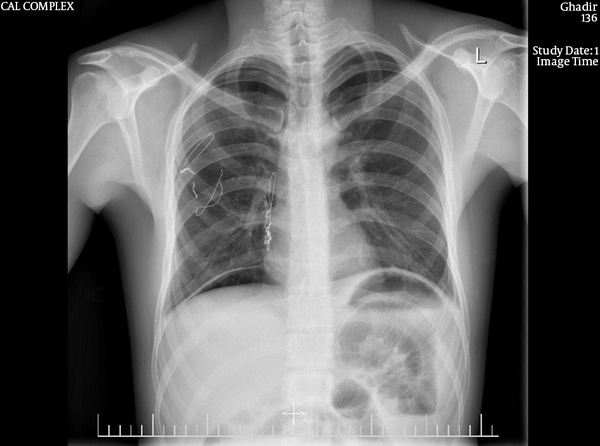 Chest X-ray showed free air under diaphragm Figure 2). Because of abdominal tenderness, abdomino-pelvic Computed tumography CT scan with intravenous and oral contrast was done. CT scan of the abdomen showed a defect in the abdominal wall with herniation of small bowel loops Figure 3). We decided to repair the Traumatic Abdominal Wall Hernia (TAWH) acutely. 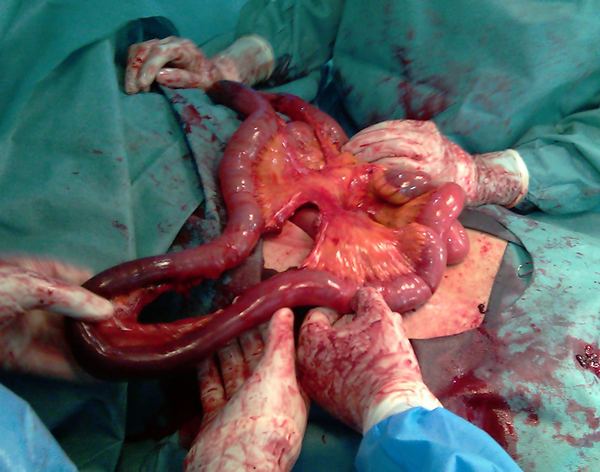 Exploratory laparotomy was performed through a midline vertical incision. The fascia was disrupted below the umbilicus and about 80 to 100 cm of the small intestine was incarcerated into the fascia. The small bowel was completely ischemic and nonviable. As there were more than 200 centimeters of the bowel left intact, we resected 100 cm of the ischemic small bowel. Branches of mesenteric arteries in distal of ileum were lacerated and bleeding was controlled by repairing the ileal mesentery. End-to-end anastomosis of intact remained small intestine was performed. There was also retroperitoneal hematoma in bilateral zone two and also zone three that did not expand during the operation. No available muscle and fascia were debrided and abdominal fascia closed with nylon one loop (Figure 4). The patient was discharged from hospital after 10 days and in 6 months' follow up; he did not have any problem associated with his trauma. Traumatic abdominal wall hernia (TAWH) is assumed to be caused by a force sufficient to disrupt the underlying muscle and fascia of the anterior abdominal wall, but not the tough and elastic overlying skin (7, 8). Of the reported midline traumatic hernia, only one was noted in the supra umbilical area (1). Most of the defects are lateral to the rectus sheath through the oblique and transverse muscles in the iliac fossa region (1). The most common mechanism of injury is motor vehicle crash (Table 1) (9). 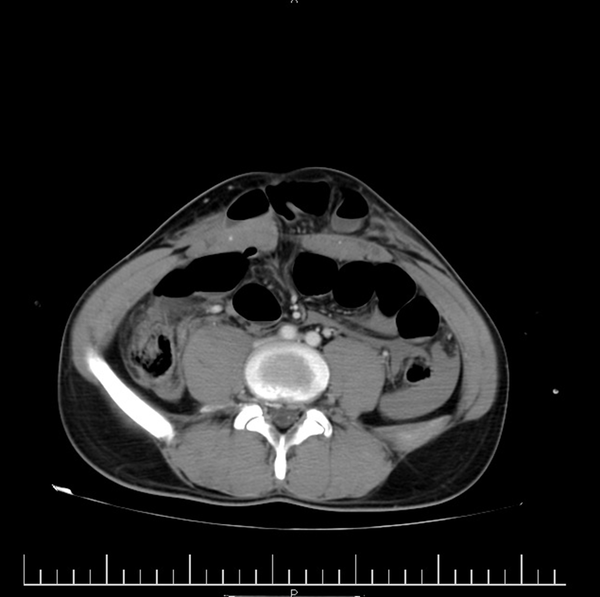 Associated intra-abdominal visceral trauma is common in in patients with TAWH, but depends upon the location of the herniation. Infra umbilical ventral hernia is rarely associated with intra-abdominal injury (1). There was one case of TAWH with associated splenic and renal injury (10). In all other cases, the noted injury affected bowel and mesentery (7). These hernias are almost always seen immediately after the trauma, although occasional cases of delayed appearance have been reported. The differential diagnosis includes rectus sheath hematoma and preexisting abdominal wall hernia or tumor (1). Certain criteria must be fulfilled for the diagnosis of traumatic abdominal wall hernia: there should be no penetrating wound on the overlying skin and no peritoneal sac identified in the defect at the operation (1). Traumatic Abdominal Wall Hernia(TAWH) will be recognized by suspicion of the trauma team to it. If patient has out of proportion abdominal pain, physical examination should be repeated. Rarely, the surgeon detect TAWH during exploratory laparotomy (7) (Table 2). A study (11) reported 70 cases of pediatric bicycle abdominal trauma patients which 80% (17/21) had severe abdominal injury including TAWH in three cases. Some classification has been proposed for TAWH. Wood et al. identified three categories based on the size of the rupture and cause of injury. The first group comprises lower quadrant abdominal defects and hernias caused by blunt traumas most commonly from a handlebar. The second category consists of larger defect hernias following motor vehicle crashes. The third category includes intra-abdominal bowel herniation into rents of retro peritoneum. Lane et al. divided TAWH into two types: low energy injuries following impact on small blunt objects and high energy injuries usually as a result of automobile and pedestrian collisions (8). Clain described three varieties of traumatic abdominal hernia in 1964: the most common, is caused by a tear in the conjoint tendon; type two occurs when there is a tear in the rectus muscle remote from the inguinal origin; and type three, the least common, occurs when the rectus muscle is avulsed from the pubic bone (12). Our patient appears to have developed a type two abdominal wall hernia. Type two hernias have been reported most frequently following traffic accidents (especially since the advent of seat belts), falls from great heights, and secondary to goring by animals (12). In these circumstances we can perform laparoscopic approach to find associated injuries in the abdomen. Two cases of non operative management were also reported (13). Researchers in Toyama prefectural central hospital in Japan managed a 27 year old boy with TAWH conservatively because of the associated injuries and peritonitis (perforation of transverse colon, duodenum, pancreas and open book fracture of the pelvis).They performed laparotomy for other vital injuries and did nothing for abdominal wall herniation repair. After 16 months of follow up the hernia disappeared (14). According to our literature review primary repair of TAWH is advocated. In high energy trauma with associated injury, midline laparotomy is needed, and in low energy trauma (with no other associated injury) the surgeon can repair the hernia from the site of herniation. In both cases prosthesis is avoided because of the high risk of post-operative wound infection. In contrast, in some articles the use of a prosthetic mesh in TAWH has been reported to reduce hernia recurrence, especially in obese patients (15). The most common surgical intervention is ligation of the bleeding mesenteric vessels and resection of the ischemic bowel. There have been reports of micro-vascular repair of the torn mesenteric vessels following an avulsion with good outcomes. After surgery, the risk of further bowel ischemia remains high. Therefore serial blood gas measurements with a follow up CT scan at weekly intervals may be indicated to assess further ischemia. In a retrospective review of 34 patients with TAWH by a study only 24% of cases had their hernias repaired acutely. They questioned early surgery in some cases and suggested that the mechanism of injury should be considered to decide the need for urgent laparotomy. They concluded that occult TAWH discovered by CT scan may not require urgent repair and that those resulting from motor vehicle collision were more likely to require laparotomy (15). In a case report, a 61-year-old man without associated injury was observed for 24 hours and discharged and his hernia was repaired electively six weeks later with prosthetic mesh (16). In our case, because the patient had abdominal tenderness and air under diaphragm, we did urgent laparotomy as we were suspected to hallow viscus perforation and could not repair the abdominal wall defect later. Also the patient was young, stable with normal body mass index (BMI); so we did not use any prosthetic mesh for reinforcing the hernia repair. TAWH present mostly with generalized abdominal distention and tenderness. First, the mechanism of injury should be considered when deciding if a patient with a In cases with apparent TAWH, associated injuries is common, but in those patients diagnosed only on computed tomography, emergent operation may not be required. In patients suffered from TAWH with no associated injury, incision over the abdominal wall defect is better than midline laparotomy if the patients do not need operation for any other reason. Finally if the patient is not hemo-dynamically stable, after resolving the life threatening problem, repair of the TAWH can be postponed to more stable time for better prognosis. In those with weak abdominal wall like eldery people, mesh repair of the defect is preferred.